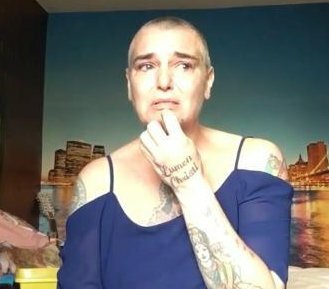 Sinead O'Connor is battling suicidal thoughts once again after taking up residence in a New Jersey motel. The Nothing Compares 2 U singer has a history of mental illness and in a recent Facebook video post, the star admitted she is at one of the lowest points in her life. "I'm all by myself," she cried in the near 13-minute long footage, which was filmed from her motel room and posted online on Thursday (August 3). "And there's absolutely nobody in my life except my doctor, my psychiatrist, the sweetest man on earth, who says I'm his hero, and that's about the only thing keeping me alive at the moment ... and that's kind of pathetic." Sinead explained she is "now living in a Travelodge motel in the a**e end of New Jersey" because she feels ostracised from her loved ones. "I want everyone to know what it's like, that's why I'm making this video," she continued. "Mental illness, it's like drugs, it doesn't give a s**te who you are, and equally what's worse, it's the stigma, it doesn't give a s**t who you are. The sad video was published just over one year after the 50-year-old sparked concerns for her well being in May, 2016, when her family members reported her missing in Chicago, Illinois amid fears she was going to commit suicide by jumping off a bridge. An official search was launched across the city, but it was eventually called off, with Sinead later insisting she was "too f**king happy" to kill herself at that time. Sinead's latest Facebook revelation also emerges days after rumours surfaced suggesting the star plans to make a career comeback by singing for fellow Irishmen Conor McGregor as he makes his big entrance at his highly-anticipated boxing match with Floyd Mayweather, Jr. in Las Vegas on August 26.